Ironing clothing has never been anyone’s favorite household chore, but it is a necessary thing we often need to do. If you have an old iron, or just a really terrible one in general, you know the fear of setting it down on an article of clothing and lifting it up only to see the fabric scorched underneath. If this has happened to you multiple times, then you need a new iron, and a steam iron would freshen up all of your clothes in one fell swoop. If you have to iron something, why not use a great iron that makes it fun? Rowenta is known for producing some of the best irons out there and this one in particular just looks like an incredible artwork. Looking at the iron the first time can be a bit intimidating since it has so many different knobs and buttons you can push, but once you have used it a couple of times it’s fairly easy to figure out all of the settings. Clad in a sleek dark blue design, the turquoise accents give it a kind of space-like look that will blow you out of this world with its capabilities. This steam iron has all of the bells and whistles you could think of an iron having. The sole plate is created out of stainless steel while also being coated with an ultra-thin silicate coating. Because of this coating, it has both a tougher and smoother surface for better non-stick and scratch-resistant properties. Over the face of the whole sole plate are the micro steam holes for optimum steam diffusion on the entire fabric. With a total of 463 steam holes, it is guaranteed your fabric will be wrinkle free in simply a matter of mere minutes. There is also a precision top that offers high steam concentration to give off an output of 210 grams per minute. 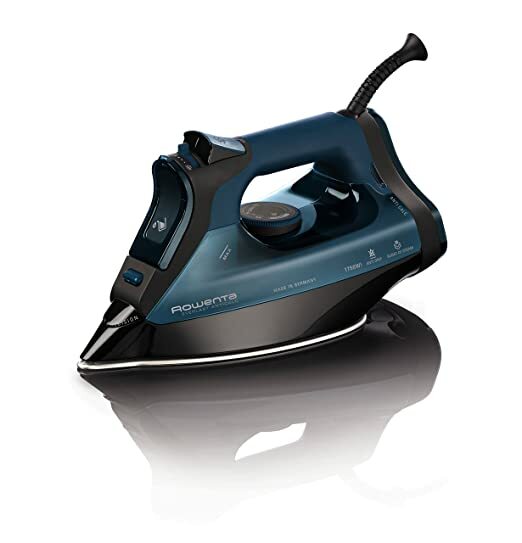 Compared to other steam irons, this gives you 30% more steam on your fabric than the leading competition. Capable of both vertical and variable steam you can get completely professional ironing results in the comfort of your own home. If you find that you need a little something extra for tough wrinkles, this product also has the option to actually spray water on your clothing if you choose. If you are trying to revive a shirt that has been hiding underneath your bed for a few weeks, there is probably a good chance that the wrinkles are really stuck on there. Giving it a few spritzes with the water spray and then letting it sit before you iron it can help all of the wrinkles come out a lot easier than just ironing alone. The 320 milliliter tank will be able to hold enough water for quite a few different articles of clothing to prevent constant trips to the sink to fill it up. In regards to safety, this iron does have an auto shut off sensor so after a few minutes of non-use, it will automatically turn itself off. This is wonderful for those who tend to be a bit forgetful and leave important items on when they leave the house. You won’t have to get halfway through your morning commute and remember that you forgot to turn something off. This ensures your ultimate safety by turning itself off and not leaving you do to the guesswork. With the ability to self-clean, you’re not going to have to struggle to get burn marks or other debris off of the iron. Not that you will have any burns with this product anyways. When it comes time to clean this, it’s as simple as turning it on to self-clean and leaving it alone to do its own thing. The anti-drip sensors will prevent your nice newly ironed shirt from becoming soaking wet if you accidentally tip the iron the wrong way. One of the most common issues with irons is the dripping of excess water onto your clothes and causing you to start all over again on your ironing artwork. This will no longer be a problem if you choose to purchase this model. Ready-temp controls unique to this model in particular are able to digitally control the sole plate temperature and indicate when you have reached your desired temperature setting. This will save many of your garments lives in the long run when you can avoid setting an overly hot iron on a sensitive piece of fabric. Also, instead of trying to read a small dial and figure out when you have reached your temperature setting, this offers an LED display to indicate vital information for your ironing project. One of the only issues with this iron is the fact that it weighs 3.85 pounds. While the weight will be great and useful to get the wrinkles out of your clothing, it can be somewhat tedious to keep holding for extended periods of time. If you decide that you are not pleased with this iron due to manufacturing defects or flaws in the workmanship, you can easily return it for up to one year on a limited warranty. If this sounds like the deal of a lifetime to you, this iron can be purchased on Amazon for $139.99. Another Rowenta product that is sure to change the way you iron has made its way to the second place on our list. Rowenta was created in the early 1900’s when its creator thought there needed to be some way to fix wrinkly clothes without having to re-wash them again. Creating the very first iron, it was a great success that was a simple, iron shaped piece of metal that could be heated up and used on clothes. Since then, Rowenta has been paving the way for different creations such as coffee makers and hair drying bonnets to make everyday life more convenient for the general population. Hard water is found in 85% of homes in the U.S. today, and while it is not harmful to our health, it can cause issues with our appliances. This type of water can be described as water that is high in mineral content such as calcium and magnesium. You may notice the effects this has on your shower head or faucets due to the white, almost chalky effect calcification has on them. When using hard water on irons, it has the tendency to create the same calcification issues, and can significantly shorten the life of your product. 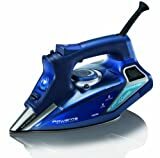 However, Rowenta has created an iron that is able to withstand these effects and nearly double the life of your iron. In the past, insoluble mineral deposits would cake themselves onto your iron, leaving debris behind on your clothes, and causing the water to eventually get blocked from even coming out. 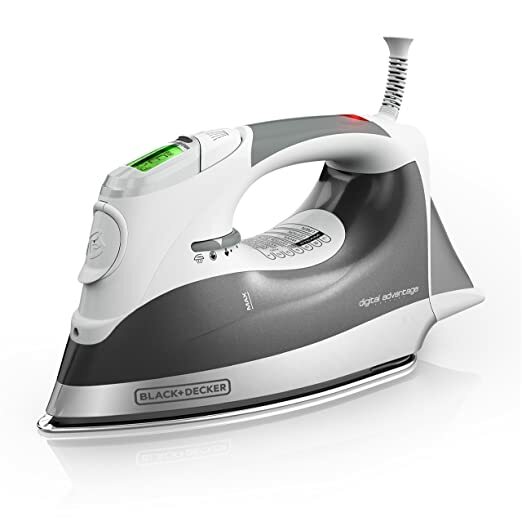 To fight the scale that builds up in irons over time, Rowenta created an Everlast Anti-Calc iron to prevent the caking up of the calcium to even begin in the first place. You no longer have to worry about lime scale building up and shortening the life of your product, or causing your iron to look like the sinks and faucets in your home. This Ever Last iron is able to capture the lime scale particles in the calc collector to prevent them from rising to the surface and ending up on your clothing. 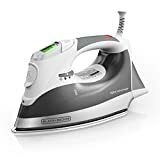 Because of this high performance steam iron, all of the lime scale that could cause serious issues with your iron only builds up in one place and is removable and washable. The collector can hold up to 1 teaspoon of calc at once and should be emptied about once every three months. Steam is plentiful with this model, as the sole plates are able to offer a unique steam distribution that most models cannot. There are steam holes evenly distributed over the entire plate so that you don’t get wet spots on your clothing, and you can have a clean, even shirt every time you iron. Because of the anti- drip technology, you’ll be able to prevent spitting and leaking before it even happens. Auto steam will also make your ironing experience easier because it is able to continually adjust the steam output to the temperature of the sole plate. Instead of struggling to adjust the steam yourself, this iron is able to take all of the guess work out of it. However, it still does feature a thermostat knob that is ergonomically correct for your hand, and can provide you a precise reading of a variety of different settings. Just in case you are in a rush in the morning and forgot to turn the iron off before you left, have no fear as there is a 3 way auto off feature to protect you against fire hazards. No matter if the iron is left on horizontally, virtually, or on its side, it will automatically switch off after 8 minutes of non-use. Weighing in at a hefty 4 pounds, this product is Available on Amazon for $119.00. 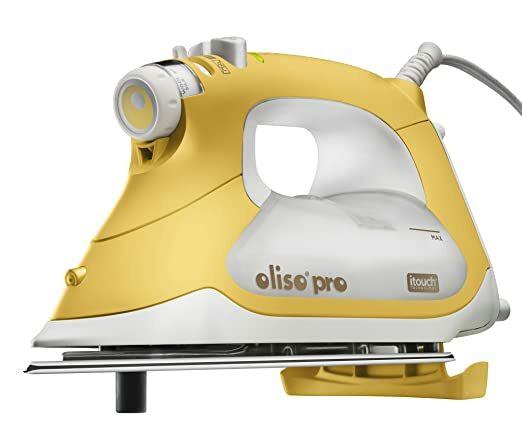 Oliso is another great choice, but looks a tad bit different from the other steam irons on our list. With an overall 70’s style look, the iron as a whole is coated in a muted yellow color, so not only will it make your clothes look brand new, but it can also add a little brightness to your home décor. This iron is one of the best on the list, and is able to earn this title with the interesting and unique features included on the model. When you are ironing, it can be hard not to accidentally set the iron down for too long and end up scorching your clothes. How Oliso choose to take care of this problem is what made it so unique. When you realize you need to iron your clothes in the morning, you’re usually already running late and trying to eat your soggy toast with one hand and holding your iron in another. It’s definitely all too easy to set down the iron and forget about it until it’s too late. This Oliso option offers you an iron that responds to your touch, and can tell when you are no longer holding it. This technology is dubbed the scorch free smart iron and it uses iTouch technology and patented scorch guards to protect your clothing. This technology works by being able to sense whether or not you are touching the handle of the iron. When it feels your hand, the scorch guards stay inside of the iron and let you do your work. However, the moment your land leaves the handle of the iron, the scorch guards will lift the iron up off of the clothing and hold it there until you come back. However, if you don’t come back for 30 minutes it will automatically turn the iron off. While this iron offers tons of great features this may just be the best of them. In addition to Oliso’s scorch guard technology, it was also designed with OnePass technology. This feature makes ironing faster and easier than ever before because of the scratch resistant, Extra Thick Stainless steel sole plate. It won’t stick on your clothing and glides over any sort of wrinkles or crevices smoothly. The detailer tip will also give you access to those hard to reach places that have always been a struggle with irons. It’s super simple now to do those in-between areas on buttons and collars thanks to this tip. If you use bias tape or have any tight corners this iron will smooth over any garment with ease and precision faster than ever before. Smart stream runs parallel with the scorch guards on this iron in the sense that it knows when you let go of the device. The moment you take your hand off of it, the Tipleplay Xtremestream technology will stop dispersing steam to prevent leaks and spritzes of water on your fabric. You can also choose between continuous, horizontal burst, and vertical burst steam based on whatever you are ironing. The extra-large water tank of 12.7 ounces means you’ll have to fill it up a lot less than some other models, and the 12 foot long cord gives you the flexibility you need to move around when you iron. Included in this package on Amazon is the ironing board cover featuring bright and cheerful orange decals. With the ideal thickness made for Oliso Smart irons, it is a 100% cotton cover with a professional fiber felt pad. While it is specifically made foe Oliso boards, it will fit all standard ironing boards with the elastic band. If you want to order this amazing iron, it is available on Amazon for $169.99. The final contender on our list that will give all of the others quite a run for their money is this wonderful Black and Decker option. Black and Decker is a very common household name, and offers quality goods for a fair price, something you can expect to see with this product as well. Simple, yet able to do its job well, this steam iron will give you the best bang for your buck. This iron features a digital display for easy readouts as opposed to the old fashioned dial that can sometimes be hard to read with the tiny print. This will show you the temperature you choose to set it at, the steam level you require depending on the type of fabric you are working with, and exactly what fabric you are ironing. This, as well as the stainless steel sole plate, will keep this iron going for years to come and keep your garments looking fresh and clean. The digital LCD screen can be set to the specific type of fabric you’re working with by looking at the corresponding numbers printed on the water tank. Each fabric has very different ironing instructions to use, and all of them require different temperatures and amounts of steam. Because of this, it can be easy to ruin a shirt by using a different setting. Gone are the days of turning to the internet to look up what your temperature should be set at, and instead just type in a number. It is truly very simple. There is an intuitive dial on the side of the iron to choose what type of steam and temperature settings you want if you aren’t a fan of the any pre-loaded options. Often when you are ironing, the handle can become uncomfortable and heavy to hold. This Black and Decker version does have a comfort grip handle with ergonomically correct features that will settle into a natural position on your hand. To keep your iron at peak performance, the auto clean system is a simple button to press so the iron can clean itself out. If the iron isn’t used for 8 minutes when it is standing upright, or 30 seconds when it is on the sole plate and side, it will automatically sense its position and turn itself off. Peace of mind and fire safety is extremely important to have when you make your final purchase decision. If this sounds like the type of iron you could use in your home, it can be purchased on Amazon for only $45. If you are a pro at ironing and you find yourself doing it multiple times a day for many different people, holding an iron above your clothing can be ridiculously uncomfortable and borderline painful. If this sounds like anything you have encountered, you may want to review the weights on the above irons to find the one that would be light enough for everyday use. However, if you only iron an article of clothing here and there on the side, you may not notice the effects of a heavy iron with such little use. Do you live in a place that uses hard water? No matter where you live in the United States, there is a good chance that you have hard water. It isn’t harmful to our health, but it can wreak havoc on our appliances. Check with your water company about what kind of water you have and if you find that you do, you may want to purchase the anti-calc option above that can protect your iron. How much do you iron? Some of the above options will cost you a pretty penny. If you tend to do a lot of ironing, then investing in a great iron that costs a bit more may just save you money in the long run. However, if you only iron once in a great while, then you really don’t need to invest in something that is going to sit on your shelf. Do you require any specific kind of setting for the ironing you do? Professional clothing stores often require daily ironing on a specific type of fabric. If you find yourself in this situation, or you need any other ironing accommodations like auto-off features, anti-calc, or one that works with bias tape, review all of the features above and choose the one that works the best for you. No, ironing definitely is not our favorite thing to do, but unfortunately it is a part of life, and can sometimes be a daily chore. 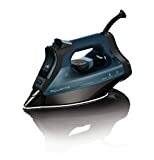 When you do need to iron an article of clothing, it is important to have an iron that will do the job well, and that you enjoy using. When you review the pre-purchase considerations that are relevant to you, choose an iron off of this list that has all of the features you want and need in an iron.